The iOptron range of Alt-Az MiniTower mounts. iOptron produce two versions of the MiniTower computerised alt-az mount. 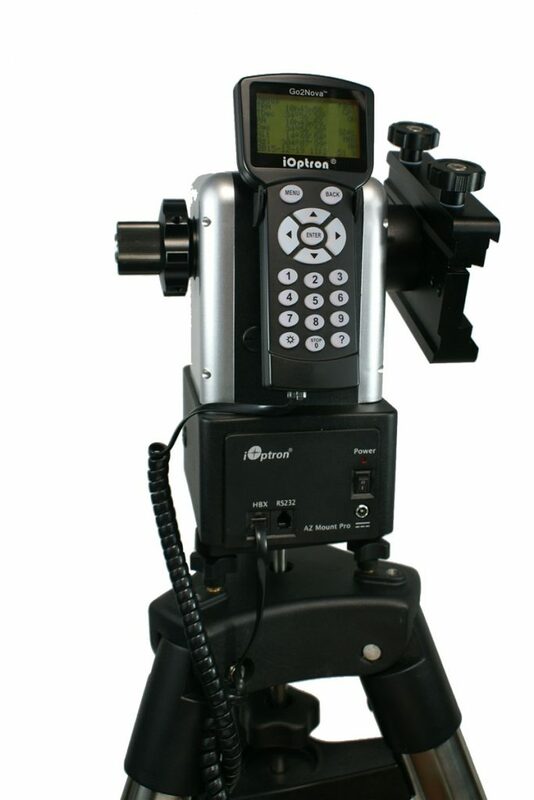 The lower cost, at ~£800, is the iOptron MiniTower v2.0 GOTO mount that is capable of carrying telescopes up to 25 pounds in weight. The iOptron V2 MiniTower. Note the secondary adjustment pillars used to make the head horizontal. It incorporates a built-in rechargeable lithium ion battery for up to 10 hours use in the field. It has a built-in WiFi adapter so that it can be controlled remotely using ASCOM, iOptron CommanderTM or Sky-Safari – a beautiful program! Both versions are equipped with a counter weight but a second vixen dovetail mount is supplied so that two telescopes can be mounted together. The alt-az head of both mounts come in an aluminium hard case. The following essay, written some time ago during the last solar minimum, describes the use of the V1.0 MiniTower whose use is identical to that of the newer V2.0 mount which incorporates enhanced components and encoders compared to the V1.0. “The mount’s ‘first light’ was under the watchful eye of the amateur astronomers attending a SPA (Society for Popular Astronomy) observing weekend. 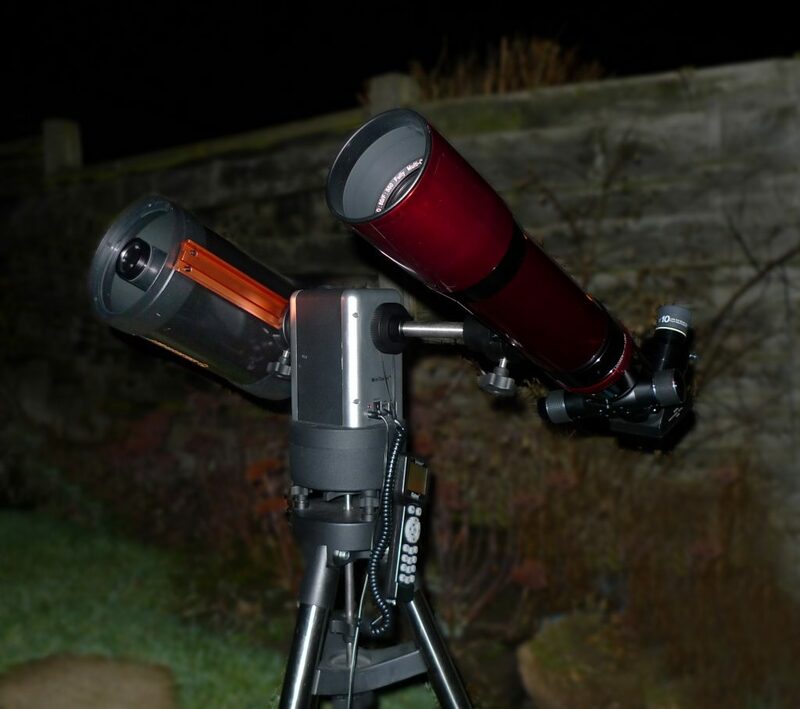 As dusk fell and Jupiter appeared in the south-west, my 80 mm ED refractor was mounted in the Vixen dovetail. The mount has first to be set into its ‘park’ position with the telescope vertical and alt-az head aligned to the south. (There is an arrow on the rotating base.) The substantial tripod was set up with its top approximately level. The head is then positioned on it, supported by three coupling rods that can be finely adjusted whilst one can easily observe and centre the air bubble in its inverted cup – so quickly giving a perfectly levelled mount. There is an azimuth clamp that must be loosened whilst this is done and this also allows the head to be rotated to face south. Not being able to see the pole star meant that was not too accurate but, as you will see, this was not a problem. The mount was powered up and after a short while the integral GPS system had updated the location and set the accurate time. The next task with a computerised mount would normally be to align it before one is able to slew to an object that you wish to observe. But with this mount this is not demanded of you. You can simply select ‘Select and slew’ and choose the object that you wish to observe. We selected Jupiter and the telescope immediately slewed round towards Jupiter but ended up a little to its west – not surprising as our alignment to the South was only approximate. But, as the head was accurately horizontal, the elevation should be correct and the only significant error would be in azimuth. A low speed azimuth slew quickly brought Jupiter into the centre of the low power field. Moving to a higher power and some very minor tweaks in position accurately aligned the mount on Jupiter. At this point, ‘Sync. to target’ is activated and the computer will then internally compensate for our inaccurate alignment south. This took less time that it takes to read this and we had effectively carried out a ‘One Star Align’ but with the object of our choice. If, as we were, you were going to observe this object anyway, then the alignment has essentially taken no time. Brilliant! The seeing was surprisingly good and the belts and zones showed up well. We then slewed to Andromeda high in the west. It was an impressive sight using a TMB 40mm Paragon eyepiece so we became more ambitious and slewed to M33 in Triangulum. 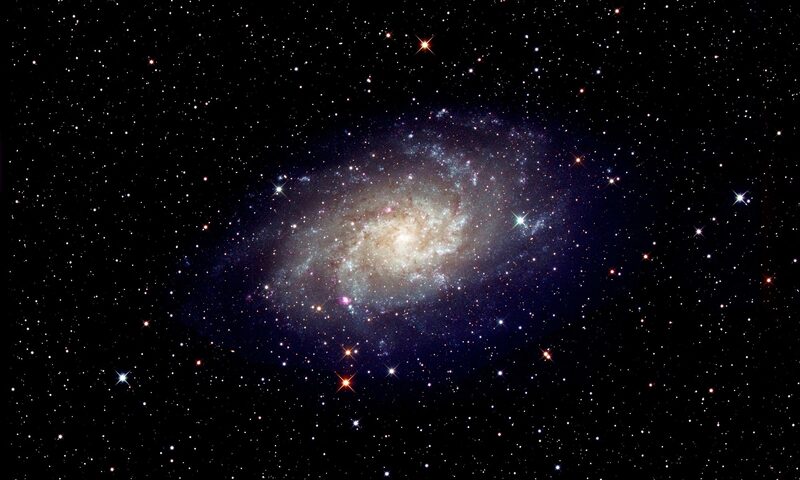 Heavy showers earlier in the day had cleared the atmosphere and M33 was easily seen with averted vision. We wanted to try mounting a TMB 110mm refractor so selected the ‘Park Scope item on the menu. The telescope moved to the vertical position and the head aligned itself due south – so now we knew accurately where south was. The somewhat heavier telescope was handled with ease but advancing cloud soon ended our observing, but not before leaving us with a very favourable first impression. The following night the clouds cleared and an observing site was found with good views from south-east round to north. This time our first target was the Pleiades Cluster on which we synchronized just as we had had on Jupiter. Our observations then took in the Orion Nebula, clusters in Auriga and Gemini and finally, as the clouds encroached from the west, the galaxy pair M81 and M82. In all cases, using a Televue 20mm Plossl, the objects were very close to the centre of the field of view. The go-to precision displayed by the mount on those first two nights had been very impressive, but what impressed our group most was the how fast we were able to begin our observations! 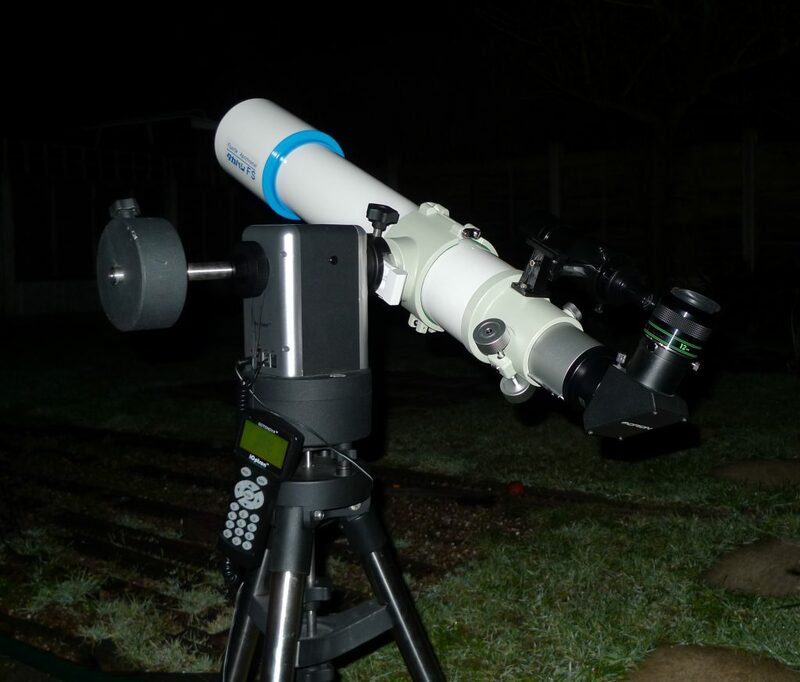 The next outing for the mount was at an astronomy weekend at Burton Manor College. The skies only cleared for a short while during one morning but gave our group a chance to see if the Sun had come out of its deep sleep. It hadn’t, not a sunspot could be seen! Unlike many computerised mounts, the MiniTower does allow one to move to and then synchronise on the Sun − after a suitable warning of course. This time we mounted an 8″ Celestron Schmidt-Cassegain on the mount and used the supplied counterweight along with a second of similar weight to balance it. The mount had no problems slewing or tracking smoothly, indicating that the MiniTower can support a scope of this size. For safety, the finder objective was covered and the telescope eyepiece pointed down to project an image onto card. The Sun’s image was easily centralised and synchronised on. Then we were able to do something I, personally, have never been able (or dared) to do before – find Venus in daylight just 9 degrees from the Sun. Having executed a slew to Venus, it was immediately seen as a tiny gibbous disk virtually in the centre of the field of view! The MiniTower provides three options for its power supply. Perhaps the neatest is to use 8 AA batteries that fit into the tower unit. It was pleasing to find that rechargeable Ni-MH batteries worked well, giving over 3 hours of use. Alternatively, a mains adapter and a 12 volt plug and cable for use with rechargeable battery packs are provided. The mount’s hand controller has a large, informative, 8 line display. I did find the controller’s back lit buttons rather ‘squishy’ but at least it does means that one is unlikely to activate one by mistake! Pressing the ‘Menu’ button brings up the main menu which includes eleven options. The most used will be ‘Select and slew’ which opens up the object menu which has eight submenus to reach the ~130,000 objects in its database including the Planets ,Sun and Moon, all the usual catalogues, 190 comets, 4096 asteroids, 88 constellations, up to 256 user objects and the ability to enter the RA, Dec of an object. The controller also has an USB port to enable the mount to be computer controlled. The MiniTower has the capability of putting a supplied counterweight on the opposing side of the mount to balance the telescope – obviously a good thing to minimise wear and give the best possible slewing and tracking performance. For light scopes though, iOptron state that a balance weight in not needed. Even better, a second dovetail is provided which may be located on the balance arm so that a second telescope can be mounted in parallel with the first. Very neat! The mount uses 12 volt DC servo motors which are very quiet in operation (great if you have close neighbours) and the positioning is monitored and controlled using optical encoders having a resolution of 1 arc second. With an accurately levelled mount, the selected object was always close to the centre of the field of view of a medium power eyepiece. To enhance the go-to performance it is also possible to carry out a two star align that will correct for any small errors in setting up the mount. The next important requirement is that, once an object has been centred in the field of view, it remains there as the mount tracks the object across the sky. For this test, a 6″ Schmidt-Cassegrain was set on the mount and a 7mm eyepiece used to view the planet Jupiter. Having centred Jupiter in the 20 arc minute field of view it was good to find that it was still precisely centred in the field well over an hour later. 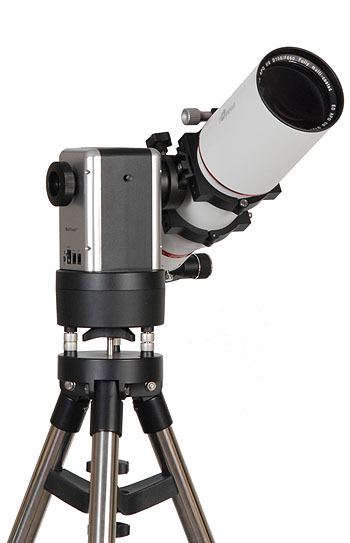 It is often said that an alt-az mount cannot be used for astrophotography due to the fact that the field of view rotates with respect to the sky. In fact, lunar photography and webcam imaging of the planets present no problems, but long exposure CCD imaging is not possible. However, by stacking a number of short exposure images, it is possible to make deep sky images by using a program such as ‘DeepSkyStacker’ which automatically de-rotates the images before combining them.